I have to say that I believe that Mrs. Butterworth stole some of Aunt Jemima’s thunder. That’s based on personal experience because after being pretty loyal to Jemima, we ended up switching over to Mrs. Butterworth’s Original Syrup more often than not. There are still other brands we purchased from time to time, but Mrs. Butterworth was a leader for a very long time. get very sticky. I have the worst time with stickiness with this particular product. It would really be nice if they could place some type of gripping device for easier use. 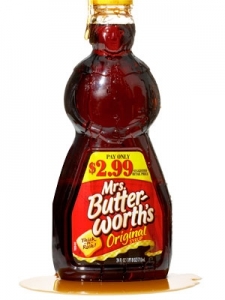 Nevertheless, Mrs. Butterworth’s Original Syrup is a great product, and it’s one of my favorites.